Monday, Dec. 26, 2011..... Just a -1.2 low tide late this afternoon... "County Recurrent" stopped by Venice Pier and shot the heck out of it. Here are several of the photos snapped. Enjoy! (Christmas Eve at Zuma Lifeguard HQ. Photo by & Copyright Will Maguire 2011. All Rights Reserved. To all of you Righteous and Incredible Recurrents, we wish you the happiest of holidays. Remember: Once a recurrent, always a recurrent. Once a lifeguard ALWAYS A LIFEGUARD. So enjoy yourselves, celebrate with family and friends and then get ready to bring it all on again in the New Year ! Woo Hoo ! 10-4, copy that ! 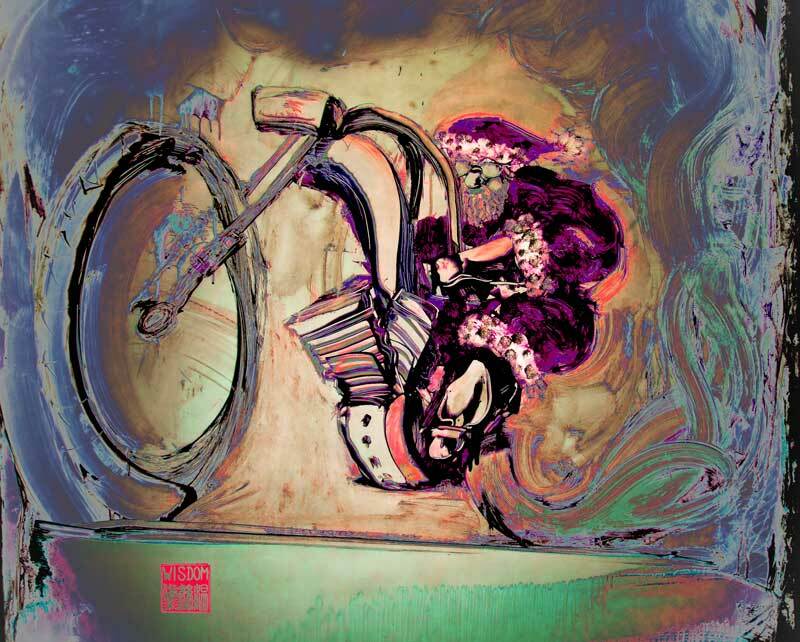 "Santa's Chopper" by and Copyright Norton Wisdom 2010. All Rights Reserved. Used here with permission. Thanks Norton ! And so, you as the reader, will have to judge for yourself which towel is best! Both are the same size. 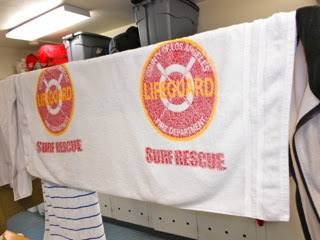 Gabe's towel is screen printed and has the special advantage of allowing one to wrap the towel around one's waist to enable changing of wet lifeguard trunks in the privacy of your tower. Joel's towel is embroidered. Samples of each towel are shown below. Both are approximately six feet long. Your comments and votes are encouraged. Joel's towels are available at the Southern Section LACOLA Locker. Gabe's towels are nearly sold out with only a couple of remaining towels available. Shipping adds $10. to the otherwise $30 price tag. When I was a kid growing up along the Santa Monica Bay Beaches there were no lifeguard stations or lifeguard towers on the sand anywhere, while today they are lined up in abundance. Why? Because there were no lifeguards. You were on your own when you swam in the Pacific Ocean. It wasn’t because there were very few swimmers back in the early 1920’s. On the contrary the beaches and ocean were crowded with bathers as can be attested to by the photo below. The beaches were just as busy or even busier back then as they are today. The beach was a close-by recreation destination in the days before more distant travel was not as easy as it is now. Crowds would flock to the beach on the big, red electric streetcars or in the family Model T Ford. Drownings were fairly commonplace. With no lifeguards eighteen swimmers drowned over one weekend in Newport Beach. In 1918 thirteen people drowned in one day off the beach in San Diego. There were lifeguards in those days but they weren’t on the beach, they worked inside the many salt water plunges that dotted the coastline. Sometimes a worried beachgoer who spotted trouble would run and summon these lifeguards to leave their posts and come outside to effect an ocean rescue. By the time this information was communicated it was often too late; ocean rescues have to be made fast. 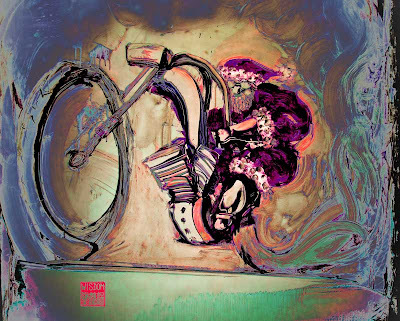 A few beaches had a gong or a bell out on the sand that could be clanged upon, the noise notifying the indoor plunge guards, if they heard it, that there was trouble afoot. Of course there was always a small boy or two who might just clang the bell to set off a bit of action. Then there were some attempts to form unpaid, volunteer lifeguard forces but they weren’t found on many beaches. Plunge Lifeguards, 1920’s. Several of these guys later became L.A City Beach Lifeguards, two of them are Bink Hedberg and Leo Cronin to the far right. In 1925 two of the beach cities of Santa Monica Bay finally decided the time had come to protect the swimmers that flocked to the sands by the thousands, and also the tourist dollars that followed. 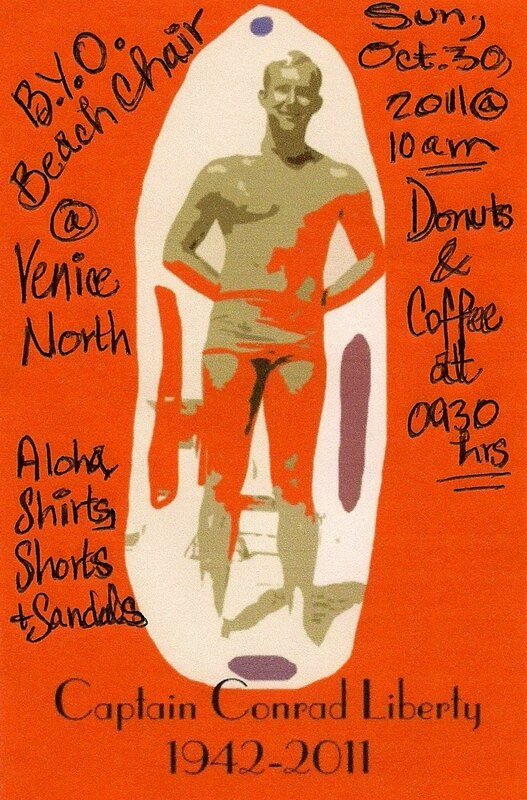 That year Hermosa Beach hired as its first ever paid beach lifeguard, Jim Reinhard, and Venice Beach employed George Wolf as its first lifeguard, a couple of strong, former school team swimmers. The other beach towns would soon follow. All alone that first year, Jim and George had miles of beach to cover, and with primitive equipment, and not even a tower to sit in. George at first worked out of the Venice Plunge while Jim simply walked the Hermosa sands. By the late 1920’s and early 1930’s all the beach towns in the bay realized the need for lifeguard protection and formed their own small crews, but eventually three entities emerged to cover the fifty miles of coastline from San Pedro in the south to the Ventura County line to the north: the Los Angeles County Lifeguard Service, the Los Angeles City Lifeguards and the Santa Monica Lifeguards. Each soon had its own headquarters building but the locations changed through the years and the buildings became more substantial and modern as time went on. In the 1970’s the three lifeguard forces finally merged into one: The Los Angeles County Lifeguards, the largest, best equipped and best trained in the world. They protect over seventy miles of beaches twenty-four hours a day, including Catalina Island. Thousands of rescues are made each year; a drowning is a very rare occurrence. I knew the two 1925, first beach lifeguards, Jim Reinhard and George Wolf quite well. Jim lived near me and passed away a few years ago at the age of ninety-five. I loved hearing the stories they would tell of those early days on the beach. I am wondering now why I never thought to ask them what their wages were as beach lifeguards in 1925. And I wonder if they could top the thirty-five cents an hour I earned as a Venice Plunge Lifeguard at the end of the Great Depression in the late 1930’s, or the huge seventy-five cents per hour I made as a Los Angeles City Beach Lifeguard soon after. *** IN THE BEGINNING, THE LIFEGUARD, by Cal Porter. Copyright Cal Porter 2011. All Rights Reserved. Used here with permission. All photos courtesy of Cal Porter. Many Thanks to Cal for another great story. We've also said it before and we will keep on saying it: Please submit a story of your own or tell the story of a rescue by a colleague of yours that you witnessed that was something special. We need more content to keep our readership entertained and enlightened. Thank you for your consideration. Wow! LACo Recurrent, Sean Young, recently posted (on our "County Lifeguards And Alumni" Facebook page) a link to a website featuring some great black and white photos of some renowned LACo recurrents in the 1980's. See if you recognize them! Fantastic! Thanks so much, Sean! Eugene started out by getting fully submerged in the ocean to test its temperature. Thereafter, he proceeded to do a several tower length soft sand run intermixed with a series of alternating push ups and sit ups. And now that his heart rate was up and his engine was fully engaged, Eugene hit the ocean and did two round trip buoy swims out to the SMN Tower #8 buoy. This photo below shows Eugene in distance at center of frame at water line just before he began his workout as set forth above. p.s. And Eugene's post workout snack is illustrated in the photo below from the squad room at CSHQ. Greek yogurt with fresh blueberries and almonds. Mix it up and chow down. 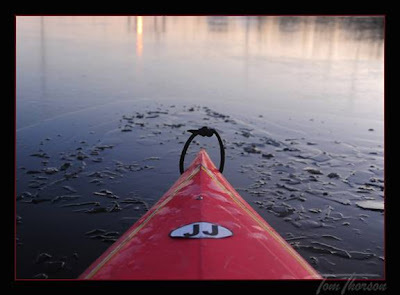 "Morning kayaking, around 20 degrees and some ice…"
"Funny it was so cold today that while I was paddling the ice was forming on my kayak...when I got out the nose was covered in ice. Ice was about 1/8 of an inch. In some areas it was too thick to break with the nose of the boat." Needless to say, a very impressive discipline! 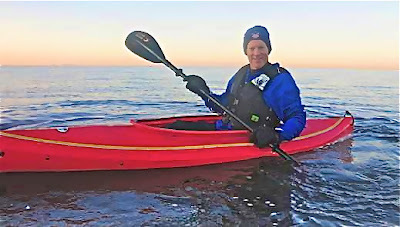 And check out Tom's sub freezing kayak outfit below, esp. his headgear! Sticker by "JJ I SWAM FOR JJ". Dateline: Saturday, Dec. 10th, 2011 from approximately 1:30 pm - 5 pm. Another minus tide in the late afternoon. To see more of the beach from Will Rogers Lifeguard HQ to the Santa Monica Pier and back, please check out our Facebook Group page, "County Recurrent". "Friday Nite Lights At Venice Pier"
Dateline: Friday, Dec. 9th, 2011 at approximately 4:30 - 5 pm. A minus tide too!... -0.5 (at 2:59 pm). Just Outstanding! An Absolutely E P I C sunset! To see more of these photos of this spectacular evening, check out our Facebook Group page, "County Recurrent" or the "County Lifeguards And Alumni" Facebook group page. (Re: Above Photo Source Info. 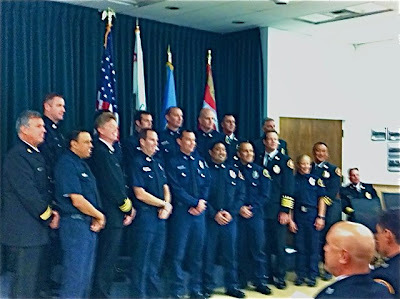 OK, now here is a Really, Really Great Photo of the Recent LACoFD Promotional Ceremony held on Nov. 30, 2011, courtesy of Amy Meier of the LACoFD. Photo Credit: LACoFD Department photographer Douglas Morrison. 10-4! *** Many Thanks to Amy Meier. *** Now... Does anyone want to 'step up' and name everyone in the photo from Left to Right in both rows? *** Congratulations to each of these great LACo former recurrents who have promoted up the OLS Ladder to Captain! 10-4. "County Recurrent" Presents: A Fall 2011 Photo Smorgasbord! Since we've temporarily run out of substantive textual content, we thought that we would strive to excel at least photographically. We think you will be pleased with this virtual photo gallery of lifeguards, the beach, surfboards, paddleboards, etc. et al. That's all Folks! We hope you have enjoyed this photo gallery! Again, we ask that you please consider contributing a rescue story or the like so that we can share it with our readership. Step up and be counted! Tell the story of a colleague who made a righteous rescue that you witnessed or toot your own horn. Our readership is heading into the holidays and they want to be entertained. It is your duty and obligation to participate in this dialogue and to share your experience with the rest of us. Thank you for your consideration.